Gather up your LEGO® bricks and get ready for a wild and fun adventure! Sarah Dees went all out with this new collection of crazy-cool creations you can build at home with bricks you already have. What’s special about this book is that it’s both a storybook and a project book. Follow along the epic journeys of fascinating characters and the silly things they do. Then learn how to build each element of the scenes and characters with step-by-step photographs and instructions, even how to make them look damaged like they get in the pictures. The stories kick off hours of adventurous playtime with all-new, epic space ships, off-road vehicles, mysterious ancient palace ruins, jet skis, cute animals, creepy mutant bugs and more! Build and play along with three clumsy aliens living on the moon with their space blaster that’s constantly malfunctioning, and the astronauts who become their accidental neighbors after a crash landing. In another chapter, join a group of kids who transport dinosaurs to their modern lives with a time machine they find (and you build). You’ll be rolling on the floor laughing about what crazy mischief those dinosaurs get into! You and your family will have so much fun building these awesome toys and reading the stories over and over again, you’ll never want to leave LEGO® world. 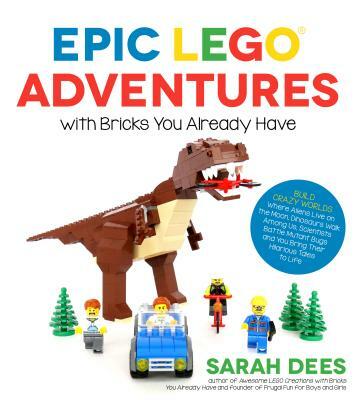 Sarah Dees is the author of the bestselling book Awesome LEGO® Creations with Bricks You Already Have (more than 50,000 copies in print!). She’s also the mom behind the kids activity blog Frugal Fun for Boys and Girls. She and her family of five kids love all things LEGO®, and her boys even helped design some of the projects you’ll find in this book. They live in Fort Worth, Texas.